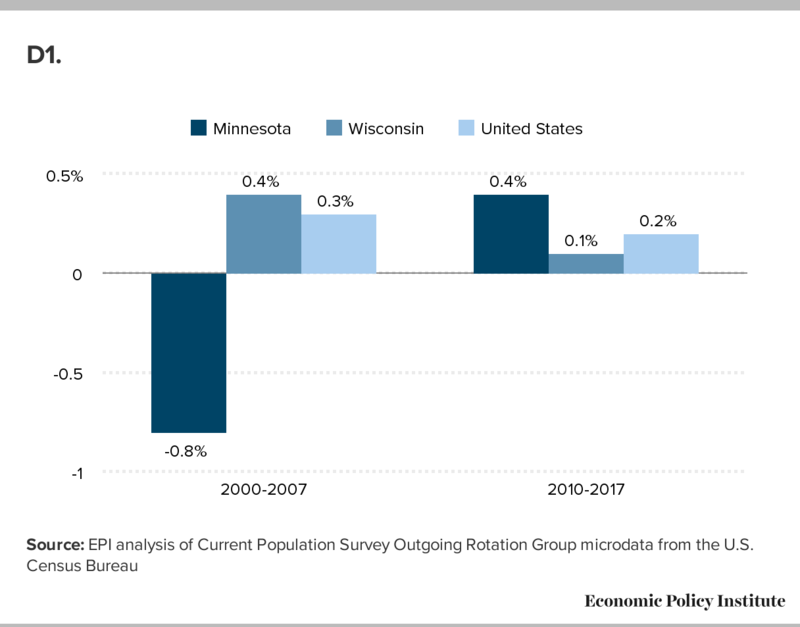 The following report describes how Minnesota’s and Wisconsin’s economies have performed since 2010 on a host of key dimensions, and discusses the policy decisions that influenced or drove those outcomes. Job growth since December 2010 has been markedly stronger in Minnesota than Wisconsin, with Minnesota experiencing 11.0 percent growth in total nonfarm employment, compared with only 7.9 percent growth in Wisconsin. Minnesota’s job growth was better than Wisconsin’s in the overall private sector (12.5 percent vs. 9.7 percent) and in higher-wage industries, such as construction (38.6 percent vs. 26.0 percent) and education and health care (17.3 percent vs. 11.0 percent). From 2010 to 2017, wages grew faster in Minnesota than in Wisconsin at every decile in the wage distribution. Low-wage workers experienced much stronger growth in Minnesota than Wisconsin, with inflation-adjusted wages at the 10th and 20th percentile rising by 8.6 percent and 9.7 percent, respectively, in Minnesota vs. 6.3 percent and 6.4 percent in Wisconsin. Gender wage gaps also shrank more in Minnesota than in Wisconsin. 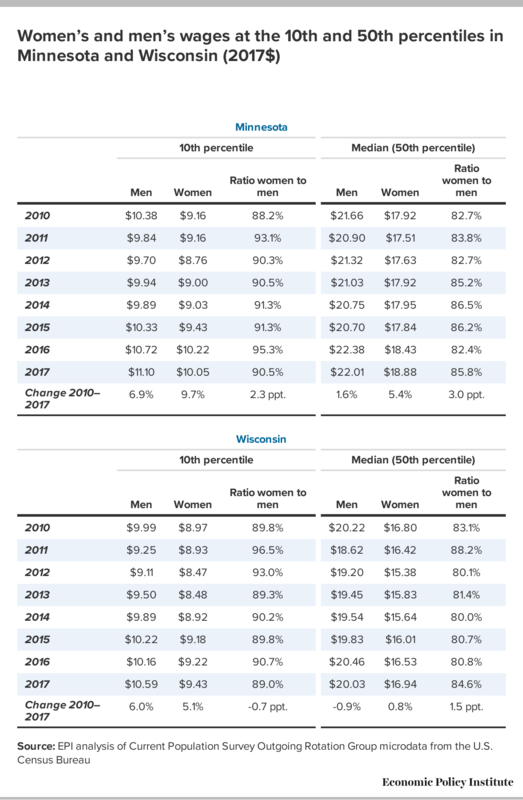 From 2010 to 2017, women’s median wage as a share of men’s median wage rose by 3.0 percentage points in Minnesota, and by 1.5 percentage points in Wisconsin. Median household income in Minnesota grew by 7.2 percent from 2010 to 2016. In Wisconsin, it grew by 5.1 percent over the same period. Median family income exhibited a similar pattern, growing 8.5 percent in Minnesota compared with 6.4 percent in Wisconsin. Minnesota made greater progress than Wisconsin in reducing overall poverty, child poverty, and poverty as measured under the Census Bureau’s Supplemental Poverty Measure. As of 2016, the overall poverty rate in Wisconsin as measured in the American Community Survey (11.8 percent) was still roughly as high as the poverty rate in Minnesota at its peak in the wake of the Great Recession (11.9 percent, in 2011). Minnesota residents were more likely to have health insurance than their counterparts in Wisconsin, with stronger insurance take-up of both public and private health insurance since 2010. From 2010 to 2017, Minnesota has had stronger overall economic growth (12.8 percent vs. 10.1 percent), stronger growth per worker (3.4 percent vs. 2.7 percent), and stronger population growth (5.1 percent vs. 1.9 percent) than Wisconsin. In fact, over the whole period—as well as in the most recent year—more people have been moving out of Wisconsin to other states than have been moving in from elsewhere in the U.S. The same is not true of Minnesota. At the time of the November 2010 elections, most states were still reeling from the economic devastation caused by the Great Recession. Although the recession had officially ended in 2009, the low point of the labor market was in 2010—the country continued losing jobs until March of that year. Thus, when newly elected Governors Scott Walker of Wisconsin and Mark Dayton of Minnesota took office in January 2011, the economic policy agendas that each pursued would largely define their respective states’ recoveries. Wisconsin and Minnesota offer a particularly useful case study for assessing the merits of two very different governing philosophies. 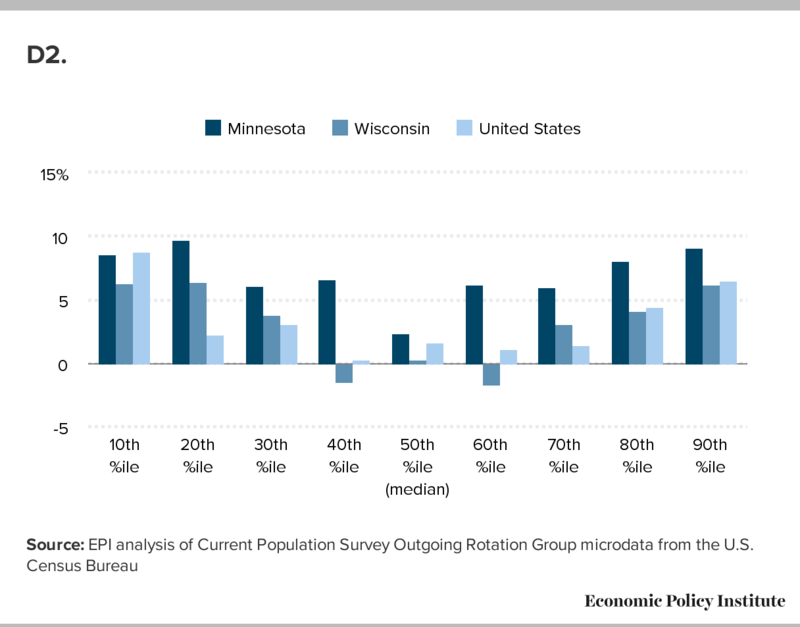 As Markusen (2015), Caldwell (2015), Aleem (2015), and others have pointed out, the two states’ geographic proximity—as well as their similarities in population, demographics, culture, and industry composition—make comparing outcomes in Wisconsin versus Minnesota a useful natural experiment for assessing how state policy is affecting economic outcomes and residents’ welfare. Though one must be careful not to attribute too much of a state’s economic performance to the policy choices of state lawmakers, there are areas where governors and state legislatures can significantly influence outcomes and set the direction for medium-to-longer-term trends. Throughout the course of their terms in office, Governors Walker and Dayton have pursued dramatically divergent agendas. Governor Walker’s policies have been typical of the most conservative state agendas: large tax cuts for businesses and higher-income households, deregulation, huge cuts in public financing of everything from K−12 and higher education to green energy programs and aid to the poor, weakening labor standards and cutting safety net programs, shifting public funding to the private sector, undermining workers’ ability to form unions, and rejecting federal dollars to invest in infrastructure or expand Medicaid (Stein, Marley, and Bergquist 2011; Stein and Boulton 2013; Umhoefer 2012; Stein 2012; Stein 2013; COWS 2011; Associated Press 2012). Walker and his allies in the legislature also brazenly gutted the state’s public-sector unions, severely limiting their ability to negotiate new contracts or collect dues, and establishing onerous requirements for annual recertification (Davey 2011). In contrast, Governor Dayton’s policies embraced the role of government in regulating markets, improving the welfare of workers and their families, and boosting private-sector growth through public-sector investment. Although divided government at the outset of his tenure prevented Dayton from implementing the entirety of his agenda, Minnesota was soon at the forefront of progressive state policymaking. The state raised its minimum wage and set it to be automatically adjusted for inflation each year (Bierschbach 2014). Minnesota raised taxes, largely on the wealthy, and used the additional funds to finance public investments in infrastructure, education, and aid to low-income families (Helgeson, Brooks, and Stassen-Berger 2013; Dornfeld 2013; Caldwell 2015). The state expanded preschool and access to full-day kindergarten. Governor Dayton’s government authorized the unionization of new groups of state-funded workers, expanded access to paid sick leave, strengthened the state’s unemployment insurance program, and was an early adopter of the Medicaid expansion under the Affordable Care Act (Markusen 2015; Caldwell 2015; League of Minnesota Cities 2011; Office of the Governor, Mark Dayton 2011). State lawmakers also enacted a pay equity law to combat gender pay disparities, legalized gay marriage, and made it easier to register to vote (Caldwell 2015; Markusen 2015). The direct effects of the Minnesota reforms were unambiguously progressive—directing resources toward low- and moderate-income households and strengthening rules explicitly meant to boost these households’ economic leverage and bargaining power. The direct effects of the Wisconsin reforms were unambiguously regressive. Fiscal resources were transferred from low- and moderate-income residents to richer ones, and rules that buttressed the economic leverage of low- and moderate-wage workers were weakened. There is very little controversy about this characterization of the respective reforms. For the Wisconsin policy path to actually deliver better economic outcomes for most Wisconsinites, the indirect ripple effects of these policy changes would have to be strong indeed. Tax cuts to rich households would have to trickle down to poorer households in the form of faster economic growth resulting in faster job growth and eventually wage growth. Similarly, union-busting would have to lead to better private-sector job growth. Only if and when business investment and job growth became strong enough to significantly improve the state labor market would low- and middle-income households see much benefit from these reforms. Thus, any failure of the Wisconsin policy changes to spur unambiguously better economic performance and job growth should be viewed as particularly glaring. Today, both states have reached a point of relative economic health—yet, as the following sections show, not all recoveries are created equal. On a multitude of key measures, Minnesota’s economic performance over the past seven years has been markedly better than that of its neighbor to the east. On virtually every metric, workers and families in Minnesota are better off than their counterparts in Wisconsin—and the decisions of state lawmakers have been instrumental in driving many of those differences. The following sections compare a host of key statistics describing economic conditions and the welfare of residents in the two states. In assessing the state-policy-driven economic outcomes of working people in Wisconsin compared with any other state since 2010, the discussion must begin with what happened to Wisconsin’s unions. In June of 2011, after months of protests, the Republican-controlled state legislature passed, and Governor Walker signed, the Wisconsin Budget Repair Bill, also known as Act 10. Act 10 took away all collective bargaining rights from state home health care workers, state family child care workers, state hospital employees, and all University of Wisconsin faculty and staff. It also restricted collective bargaining rights for all remaining state employees—except for law enforcement and firefighters—to only bargaining over wages, with wage increases statutorily capped at the rate of inflation. In addition, the bill eliminated automatic dues deduction for union members and required that all unions had to annually recertify through a majority vote of all members. Public-sector employees’ required contributions for health insurance and pensions were more than doubled, amounting to what was effectively an average 8.0 percent pay cut for affected state workers. The bill also made it easier for public agencies to fire union staff (COWS 2011; Davey and Greenhouse 2011). In summary, although Act 10 was ostensibly a bill to balance the budget, it was designed to worsen job quality for the state’s public-sector workforce and to severely weaken the state’s public-sector unions (Stein and Marley 2012). Act 10 and subsequent state budgets made dramatic cuts in funding for K−12 education, funding for the University of Wisconsin system, funding for local governments, funding for regional and local transit systems, and funding for a variety of other public programs—leading to significant public-sector employment losses and reductions in public-sector pay (COWS 2011; Stein, Marley, and Bergquist 2011; Associated Press 2015). Four years after Act 10 was passed, Walker signed a so-called right to work bill, which restricts the ability of both public- and private-sector unions to collect dues from all workers whose interests they represent (Johnson 2015). By making it legal for workers to access union benefits without paying dues, right to work laws hamstring unions’ ability to raise funding, consequently weakening their ability to support employees in bargaining for better wages, benefits, or working conditions (Gould and Kimball 2015). Wisconsin’s rapidly declining rate of unionization and the large cuts made to its public sector have serious implications for the state’s short- and long-term economic performance. Governor Walker contended that his agenda of shrinking the public sector and reducing the power of unions would lead to stronger private-sector growth, which would ultimately lead to better economic outcomes for Wisconsin workers and their families (Davey 2011, 2015). Seven years later, there is no evidence to validate this claim. State policymakers’ ability to influence job creation is easy to overstate. National or regional macroeconomic factors—such as the level of domestic consumer demand, the exchange rate of the dollar, or natural resource prices—exert a large influence on state economic growth that is outside the control of state policymakers. Further, because state governments face sharp constraints (both legal and economic) on running fiscal deficits, their ability to push back against these broader trends with fiscal policy is limited. Nevertheless, states that raise taxes on wealthier households or businesses to finance public investments will see a “balanced budget multiplier” effect—i.e., the initial expenditure on such investments does spur some additional growth, even if that growth is partially offset by the higher taxes needed to finance them. And if these public investments create favorable conditions for private economic development, over the medium term they can add up to sizable job impacts. During his gubernatorial campaign, Scott Walker claimed that his policy agenda would create 250,000 new jobs in Wisconsin by the end of his first term in office (Associated Press 2011; Davey 2011). After taking office, the governor declared Wisconsin “open for business” and began implementing his agenda of deregulation, cuts to the public sector, and large tax cuts—with tax cuts for small businesses as well as cuts on capital gains taxes and individual income taxes (New Richmond News 2011). In Walker’s first term, Wisconsin cut taxes by $2 billion (Wisconsin Budget Project 2011; Stein 2013; Hovorka 2017). Nevertheless, the state did not come anywhere close to meeting Walker’s professed employment targets. In fact, as Walker nears the end of his second term, the state still has not reached the governor’s campaign goal. Note: This table shows statistics on total nonfarm jobs, total private-sector jobs, and noteworthy industries. Appendix Table A1 shows statistics for all major industry categories. Table 1 shows that Minnesota has had stronger job growth than Wisconsin since both governors took office. From December 2010 to December 2017, Wisconsin added 216,800 jobs—an increase of 7.9 percent. In contrast, Minnesota’s job growth from December 2010 to December 2017 was 11.0 percent, or a total of 292,100 jobs. Wisconsin had lost 141,200 jobs (or 4.9 percent of total nonfarm employment) from the start of the recession (December 2007) to December 2010. Thus, by December 2017, Wisconsin had about 75,600 (or 2.6 percent) more jobs than it did a decade prior. Minnesota’s losses in the recession were not quite as severe, with the state losing 118,000 jobs (or 4.3 percent of employment) from December 2007 to December 2010. By December 2017, Minnesota had 174,100 (or 6.3 percent) more jobs than it did prior to the recession. For reference, Table 1 also shows the percent job changes for the U.S. as whole. There were also important differences in the composition of job changes between the two states, as shown in the selected industries displayed in Table 1. (Appendix Table A1 shows job statistics for all major industry categories.) The types of jobs that Minnesota has added tend to be in higher-paying industries that typically have better-quality jobs. Wisconsin’s job growth has been more mixed, with a large portion of its jobs gained in lower-paying industries. Of the 292,100 jobs that Minnesota has added since 2010, more than a quarter have been in education and health care, which has grown by a combined 17.3 percent in Minnesota since 2010—that’s faster growth than the U.S. average of 16.1 percent over the same period. Education and health care has now grown from being 15.7 percent of total nonfarm employment in Minnesota before the recession to 18.4 percent of Minnesota’s employment by the end of 2017. Minnesota’s fastest-growing industry—although not as big in absolute terms—was construction, which grew by a remarkable 38.6 percent since 2010. Total U.S. construction growth over the same period was 29.4 percent—meaning that Minnesota was adding construction jobs at over 1.3 times the pace of the U.S. as a whole. The strong job growth in both of these major industries can be largely attributed to Governor Dayton and the Minnesota legislature’s decision to invest heavily in public infrastructure and health care. Early in his term, Dayton was able to secure a $479 million bonding bill for construction and infrastructure investments (League of Minnesota Cities 2011; Luhby 2011). His administration also accepted a $1.2 billion grant from the federal government to set up the state’s health care exchange and expand Medicaid under the Affordable Care Act (ACA), providing a large injection of funds to the state’s hospitals and health clinics (Office of the Governor, Mark Dayton 2011). Later in his tenure, Dayton and the legislature passed a tax increase of $2.1 billion—mostly in the form of higher income taxes for the wealthy and higher sales taxes on cigarettes—and used a large portion of the new revenue to increase funding for education, including expanding preschool and full-day kindergarten and raising teacher pay (Jacobs 2013). In Wisconsin, the fastest-growing industry was also construction, but Wisconsin’s construction industry grew by only 26.0 percent over the same seven-year stretch—far slower than construction growth in Minnesota and slower than the U.S. average. In fact, as seen in Appendix Table A1, Wisconsin’s employment growth trailed Minnesota’s in most of the other major industry categories, including trade; transportation and utilities; financial activities; leisure and hospitality; and education and health care. Notably, Wisconsin’s education and health care industries grew by only 11.0 percent from 2010 to 2017, a period when the U.S. as a whole grew its education and health care workforce by 16.1 percent. This underperformance can be largely attributed to Governor Walker’s decisions to spurn federal health care dollars and not expand the state’s Medicaid program through the ACA. Wisconsin did achieve Walker’s vision of shrinking the public sector. State government employment in Wisconsin has shrunk by 5.4 percent since the end of 2010.3 Combined with local government, public-sector employment (excluding federal government) in Wisconsin was 2.1 percent smaller at the end of 2017 than it was in the month prior to Walker’s inauguration. For comparison, the state and local government workforce in Minnesota grew by 3.5 percent over the same period. Despite Walker’s rhetoric, there is little reason to believe shrinking the public sector should have led to faster private-sector growth. As Pollack (2009) explains, public-sector jobs support private-sector jobs. In fact, Pollack estimates that every $1 cut from state or local budgets leads to 41 cents being taken out of the private economy. It should not be surprising then that Minnesota bested Wisconsin not only in total nonfarm employment growth, but also in total private-sector job growth: Minnesota’s private sector grew by 12.5 percent, while Wisconsin’s increased by only 9.7 percent. Note: The numbers 8.1% and 9.2% mark the peak unemployment rates in the two states. The numbers 4.7% and 4.8% mark the return to pre-recession unemployment rates. However, the fact that they have arrived at the same place by December 2017 hides the fact that the path to get there was noticeably different. 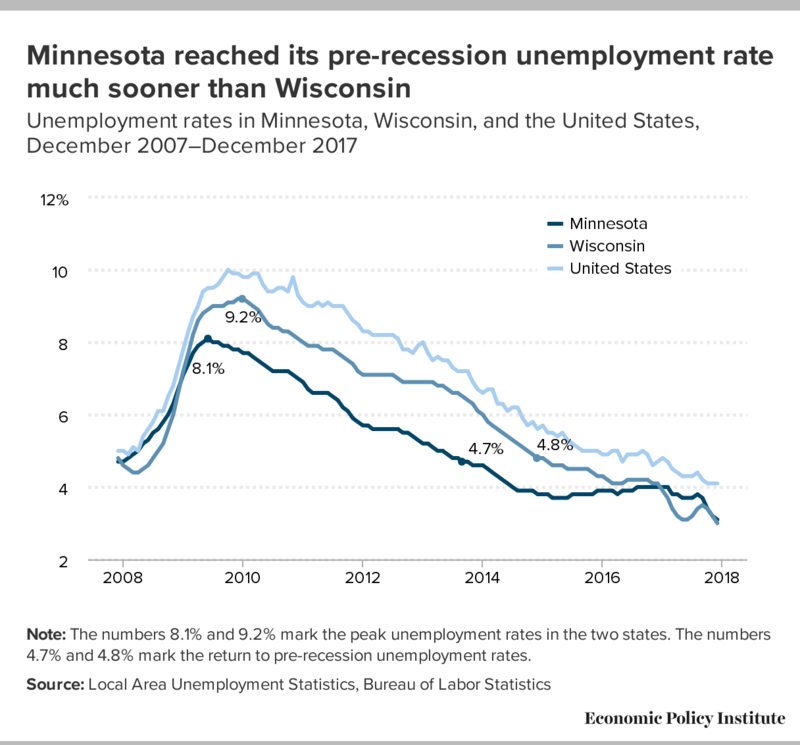 Minnesota was back at its pre-recession (December 2007) unemployment rate of 4.7 percent by September 2013, fewer than three years after Governor Dayton took office. In contrast, it took until December of 2014—15 months later—for Wisconsin to reach its pre-recession unemployment rate of 4.8 percent. What this means on the ground is that for workers who lost their jobs in the recession, it likely took longer to find work in Wisconsin than it did in Minnesota. That added time out of the workforce can have lasting effects on workers’ long-term earnings and overall well-being (Irons 2009; Shierholz and Mishel 2011). 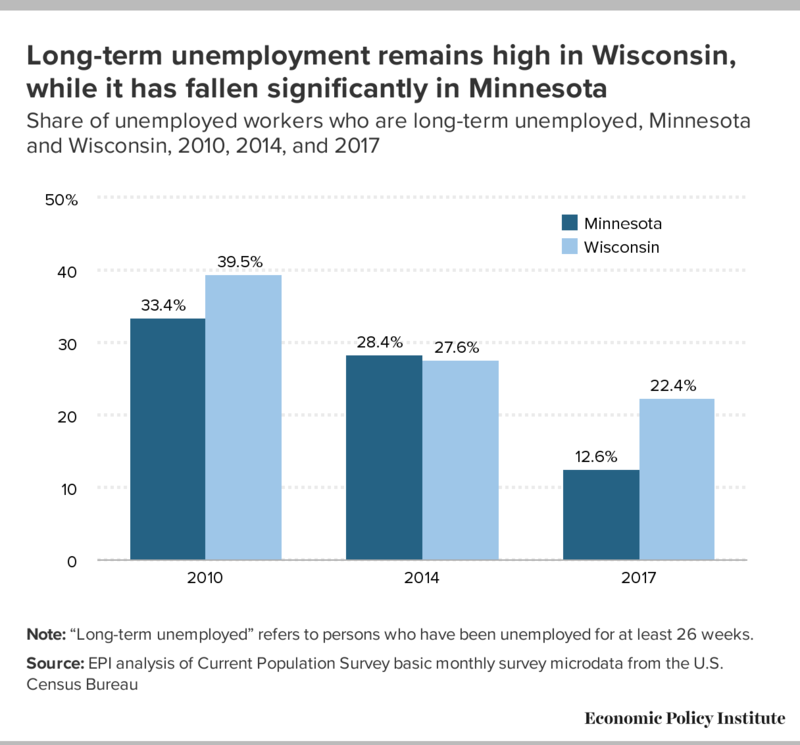 In fact, even though both states have low levels of unemployment today, those who are unemployed in Wisconsin are much more likely to be long-term unemployed than those in Minnesota. As shown in Figure B, in 2017 more than one in five unemployed workers in Wisconsin (22.4 percent) had been unemployed for at least 26 weeks—a percentage that has only modestly budged since 2014, when 27.6 percent of Wisconsin’s unemployed were long-term unemployed. In contrast, roughly 1 in 8 Minnesota unemployed (12.6 percent) were long-term unemployed—down from 28.4 percent in 2014. Note: “Long-term unemployed” refers to persons who have been unemployed for at least 26 weeks. This slower path to recovery for Wisconsin’s workforce is obviously a function of the state’s weaker job growth. Yet at the same time, the Walker administration and the state’s Republican-led legislature also cut back on the safety net programs that could have stoked greater consumer demand and job growth, while giving unemployed workers more resources to find new jobs. In 2011, they enacted a one-week waiting period on unemployment insurance (UI), effectively cutting benefits for anyone seeking relief after losing their job. The state later weakened the standard by which an employer could deny a discharged employee from collecting unemployment and tied eligibility to drug testing (Carroll 2014). Lawmakers also ignored the recommendation of a state panel overseeing the UI system, which had urged lawmakers to take the necessary actions to obtain more federal funding for unemployment—funding that would have provided an additional 13 weeks of benefits to unemployed workers at no additional cost to the state (COWS 2011). Minnesota, on the other hand, made a variety of tweaks to strengthen their state UI system, expanding eligibility for victims of domestic violence, changing the treatment of paid-out sick time or personal days so that access to UI benefits is not delayed, and making a number of additional changes to expand access to unemployment benefits (League of Minnesota Cities 2011). The state also expanded access to paid sick leave and unpaid family leave in 2014, thereby making it less likely that an illness would cause anyone to lose their job. Governor Dayton later expanded paid family leave for state employees, and city governments in Minneapolis and St. Paul passed ordinances providing paid sick days for all workers in the Twin Cities at businesses of at least a certain size beginning in 2017 (Brinkman 2013; Melo 2017). Access to unemployment insurance has been shown to keep unemployed workers searching for jobs rather than dropping out of the labor force altogether (Rothstein 2011). Similarly, having the ability to take time off for an illness, to care for a family member, or for the birth or adoption of a child—especially when that time off is paid—keeps more people connected to work, and is especially important for women (Appelbaum and Milkman 2011; Baum 2003). 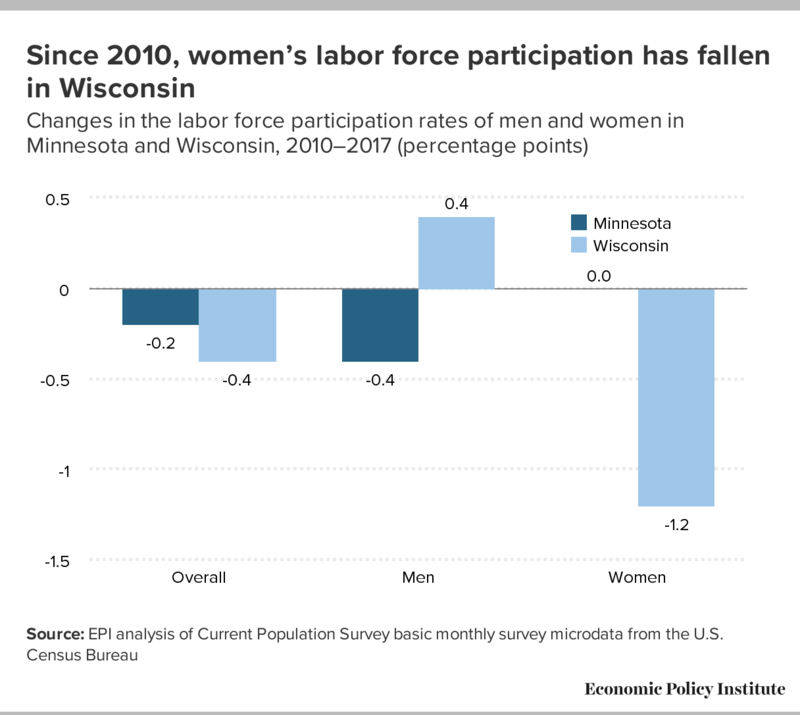 Minnesota’s more expansive unemployment benefits and paid sick, family, and medical leave policies have likely played a role in the state maintaining higher rates of labor force participation—particularly for women—than Wisconsin has had since the recession. Minnesota’s overall labor force participation rate of 71.2 percent was the second highest in the country in 2017, behind North Dakota. The Gopher State also had the highest prime-age (workers ages 25–54) labor force participation rate in 2017 at 89.2 percent. Wisconsin’s overall and prime-age labor force participation rates were also near the top in the country, at 69.0 percent and 88.3 percent, respectively. Where one can see most clearly the potential impact of the states’ differing policies on labor force participation is in looking at the trends by gender. As shown in Figure C, from 2010 to 2017, labor force participation for men in Minnesota fell slightly by 0.4 percentage points to 75.6 percent, while men’s labor force participation rose in Wisconsin by 0.4 percentage points to 73.7 percent.4 However, labor force participation for women held steady in Minnesota at 66.9 percent—the highest rate of any state in the country—while falling 1.2 percentage points in Wisconsin to 64.4 percent. While both states have relatively high rates of labor force participation for both men and women, the trends for women are better in Minnesota. After Walker and Dayton assumed office, the trends flipped: wages in Minnesota have taken off, while in Wisconsin, they have stagnated. Figure D2 shows that, since 2010, growth at every point in the wage distribution has been stronger in Minnesota than in Wisconsin. From 2010 to 2017, the median wage in Minnesota cumulatively rose 2.4 percent over and above inflation—meaning that middle-wage workers in Minnesota have had a measurable improvement in their living standards. Minnesota’s median wage growth was also stronger than the 1.6 percent the U.S. experienced as a whole over the same period. In contrast, from 2010 to 2017, the median wage in Wisconsin rose only 0.3 percent after inflation. In other words, middle-wage workers in Wisconsin are treading water, barely hanging on to the same buying power they had in 2010. Undoubtedly, Wisconsin’s determined efforts to weaken unions have contributed to the state’s poor wage growth. Research has shown that states with higher union density tend to experience stronger wage growth, both for union and nonunion workers (Cooper and Mishel 2015; Gould and Kimball 2015). Unions provide bargaining power for workers to negotiate better pay increases—thus, when more workers are unionized, more of the workforce has greater bargaining power to negotiate better raises. At the same time, unions also raise wages for workers who are not in a union because nonunionized firms still have to compete with unionized firms to attract and retain staff (Rosenfeld, Denice, and Laird 2016). If the staff at a unionized competitor are being paid significantly better than the staff at a nonunionized firm, it puts pressure on the nonunionized firm to raise pay, lest they begin losing employees. Notably, wage growth for the lowest-paid workers in Minnesota has been particularly strong since 2010. As shown in Figure D2, inflation-adjusted wages at the 10th and 20th percentiles in Minnesota rose by totals of 8.6 percent and 9.7 percent, respectively, from 2010 to 2017. Over the same period, wages for the bottom quintile of workers in Wisconsin also rose more than for middle-wage Wisconsinites, climbing just over 6 percent at both the 10th and 20th percentiles. The fact that both states experienced wage growth at the bottom of their wage distributions is likely the result of improvements in the labor market, which tend to have an outsized role in affecting pay for low-wage workers: As unemployment goes down, employers have to bid up wages in order to hire and retain staff. 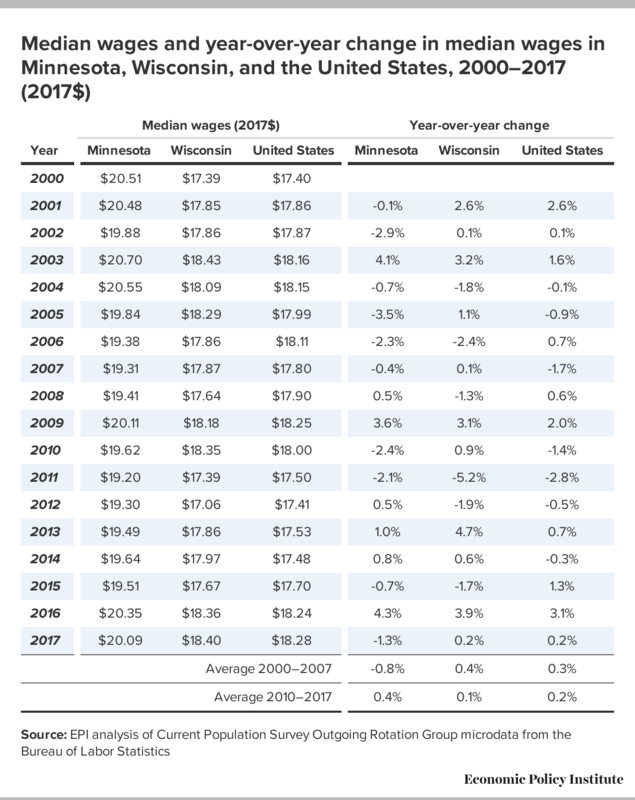 However, during this period, Minnesota also enacted a sizable increase in its minimum wage—raising the state wage floor from $7.25 in 2014 to $9.50 in 2017. This undoubtedly helped boost the pay of Minnesota’s low-wage workforce more substantially than what market forces alone accomplished in Wisconsin. Not only did Minnesota experience better overall wage growth than Wisconsin, the state also made greater progress in reducing gender pay inequities. As shown in Figure E, from 2010 to 2017, the inflation-adjusted median wage for women in Minnesota rose by 5.4 percent, compared with an increase of only 0.8 percent in Wisconsin. Men’s wages at the median rose by 1.6 percent in Minnesota, while the median wage for men in Wisconsin actually fell by 0.9 percent. As a consequence, the gender wage gap at the median in Minnesota shrunk by 3.0 percentage points, so that in 2017, the median woman worker in Minnesota was paid just less than 85.8 percent of the median-wage man. (Detailed wage data by gender are shown in Appendix Table A3.) In Wisconsin, the gender wage gap at the median also shrank a bit (1.5 percentage points) but this was driven more by men’s wages falling than by women’s wages rising. In 2017, the median wage for women in Wisconsin was 84.6 percent of the median wage of Wisconsin men. These trends were even more pronounced for low-wage workers, as seen in Appendix Table A3. 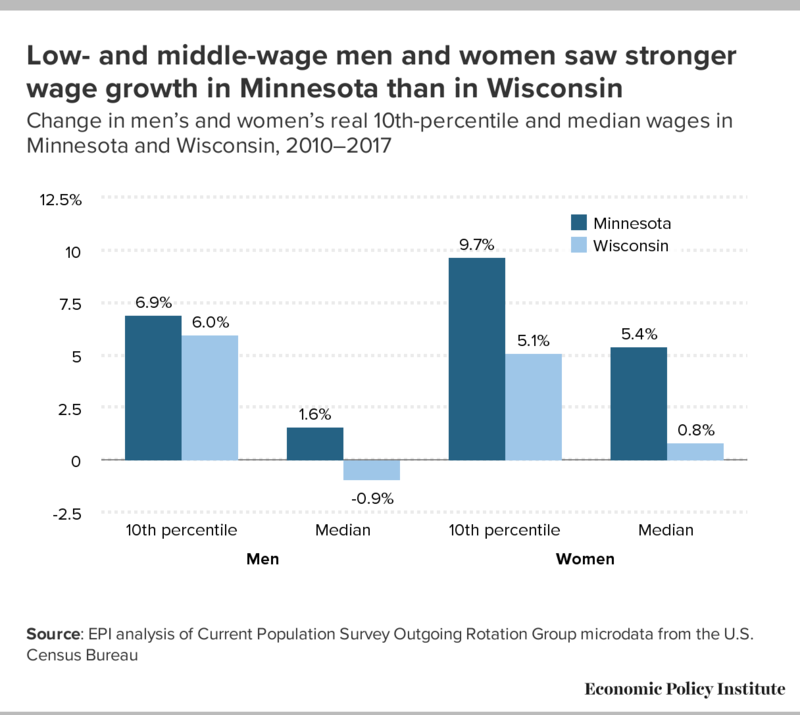 Both women and men at the bottom of Minnesota’s wage distribution experienced stronger growth than their counterparts in Wisconsin. Women’s 10th-percentile wage in Minnesota rose by 9.7 percent and men’s rose 6.9 percent, after inflation. In Wisconsin, the 10th-percentile wage for women rose by 5.1 percent; for men, it rose by 6.0 percent. In Minnesota, because wages rose more strongly for women than men, the gender wage gap at the 10th percentile shrank by 2.3 percentage points. In contrast, the gender wage gap at the 10th percentile expanded slightly in Wisconsin, worsening existing inequities in the state’s low-wage workforce. When more people can find work it typically raises household income, since more households are likely to have more earners. When hourly wages are rising on top of that, it leads to even stronger household income growth. 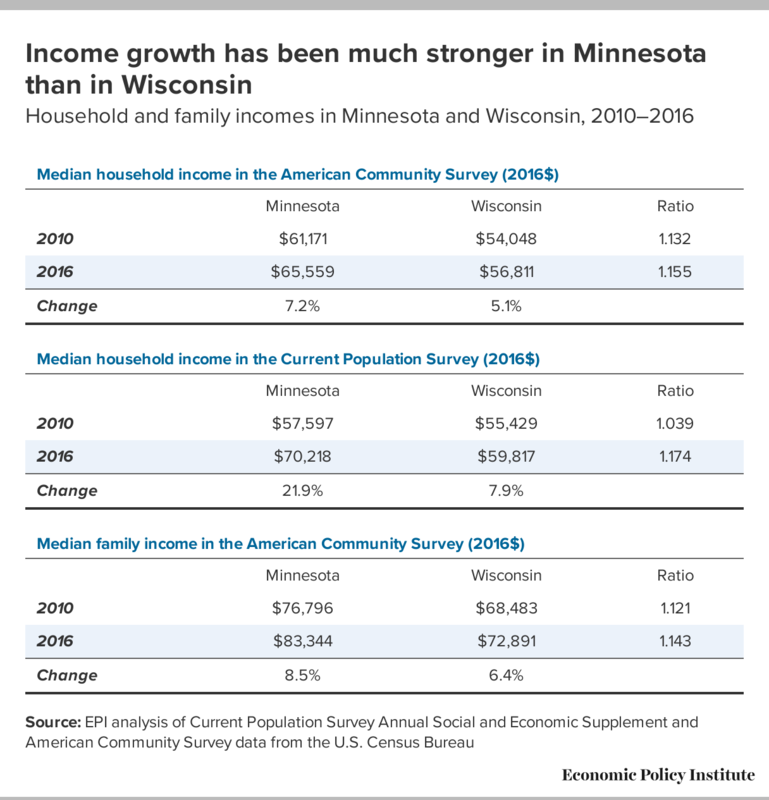 So it should come as no surprise, then, that with both faster job growth and faster hourly wage growth, households in Minnesota had substantially stronger income growth than households in Wisconsin. 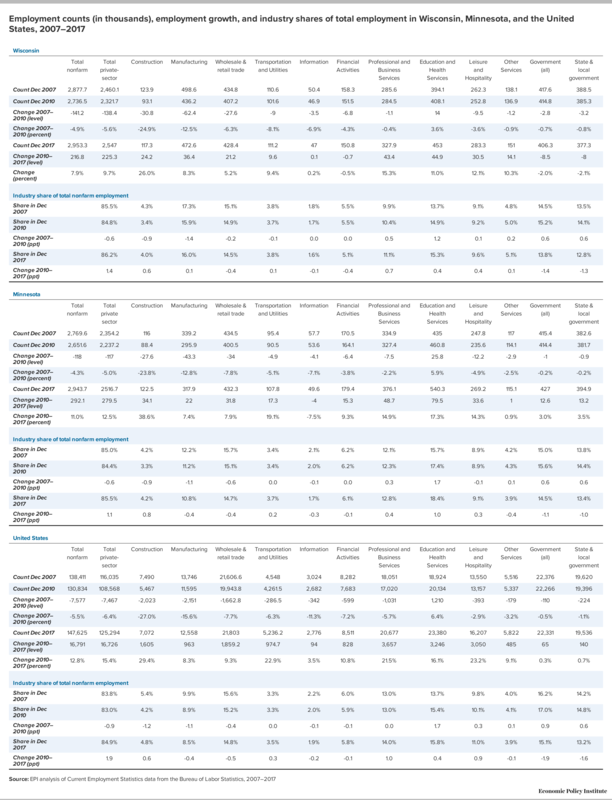 Table 2 shows changes in household and family incomes in Wisconsin and Minnesota from two different U.S. Census Bureau data sources. According to the American Community Survey (ACS), in 2010, median household income in Minnesota was $61,171 in 2016 dollars, 13.2 percent higher than the median household in Wisconsin, at $54,048. By 2016—the most recent year for which we have data—median household income had risen 7.2 percent in Minnesota, to $65,559, and 5.1 percent in Wisconsin, to $56,811. For comparison, national median household income as measured in the ACS rose by 4.4 percent over the same period. Minnesota’s median household in 2016 had income 15.5 percent higher than their counterparts in Wisconsin (U.S. Census Bureau 2018c). The Census Bureau also publishes median household income data from the Current Population Survey (CPS), which show that median incomes in Minnesota rose by an incredible 21.9 percent from 2010 to 2016, compared with growth of 7.9 percent in Wisconsin. According to the CPS, in 2010 the median household in Minnesota had income 3.9 percent higher than the median household in Wisconsin. By 2016, the Minnesota median was 17.4 percent higher than the median in Wisconsin. In 2014, the CPS was redesigned with new income questions, which may make the CPS estimates less reliable when looking at changes that cross the 2014 break in the series. Still, there is no clear reason why the new CPS questions would lead to a dramatically different measurement of income in Minnesota than in Wisconsin, given the various similarities between the two states. The Census Bureau also measures income at the family level, which is important since a single household can house multiple families—one might argue that household incomes are rising more in one state than another because of increasing co-residency of families in that state.5 However, this does not appear to be driving the differences for Minnesota and Wisconsin. From 2010 to 2017, median family income in Minnesota rose by 8.5 percent, adjusted for inflation. Over the same period, inflation-adjusted median family income grew by 6.4 percent in Wisconsin. Given Minnesota’s far better growth in incomes, it is not surprising that the Gopher State also experienced a larger reduction in poverty than Wisconsin. What may be surprising is that poverty in Wisconsin appears to have actually gotten worse since Governor Walker took office—a period in which Wisconsin’s overall economy grew steadily. Figure F shows changes in Minnesota’s and Wisconsin’s poverty rates from 2010 to 2016, using several different government poverty measures and data sources. 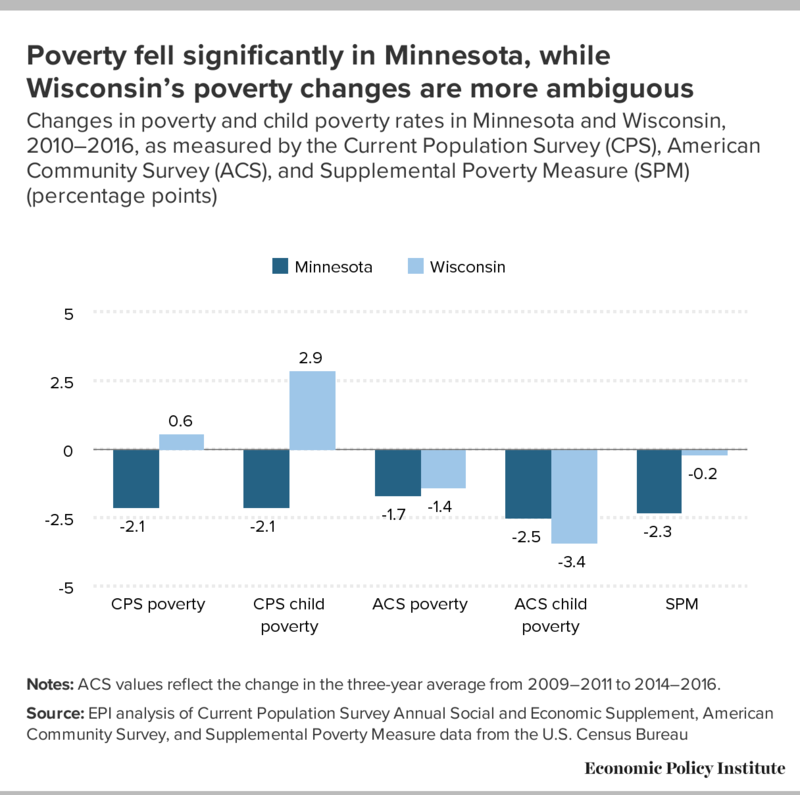 According to the CPS, the poverty rate in Minnesota declined by 2.1 percentage points from 2010 to 2016, reaching 8.7 percent in 2016—4.0 percentage points lower than the national average and one of the lowest in the country.6 In contrast, over the same period, the poverty rate in Wisconsin rose by 0.6 percentage points to 10.7 percent—ironically, about the same rate that Minnesota had back in 2010 (10.8 percent). Notably, the national poverty rate declined from 2010 to 2016, meaning that Wisconsin was bucking the national trend (U.S. Census Bureau 2017c). Notes: ACS values reflect the change in the three-year average from 2009–2011 to 2014–2016. Similarly, from 2010 to 2016, the share of children in poverty fell by 2.1 percentage points in Minnesota to 12.5 percent—unquestionably too high, but below the national child poverty rate of 18.0 percent and ninth lowest in the country. In contrast, the share of Wisconsin children in poverty rose by 2.9 percentage points to 16.3 percent—meaning that about 1 in 6 Wisconsin children were in poverty (U.S. Census Bureau 2018d). In what may have been one of the most consequential decisions made by his administration—and one of the few where there is a direct, measurable impact on the welfare of the state—Scott Walker chose not to accept federal funding to set up a health exchange or to expand Medicaid under the Affordable Care Act. As mentioned in the “Jobs” section above, Governor Walker’s rejection of federal health care money very likely cost the state jobs. It also surely prevented many of the state’s poorest residents from gaining access to health care. It is important to note also that Minnesota’s comparatively larger expansion of health insurance cannot be attributed solely to Governor Dayton’s decision to expand Medicaid under the ACA while Governor Walker did not. The share of people with public health insurance did rise more in Minnesota than in Wisconsin, by 3.6 and 1.8 percentage points, respectively. 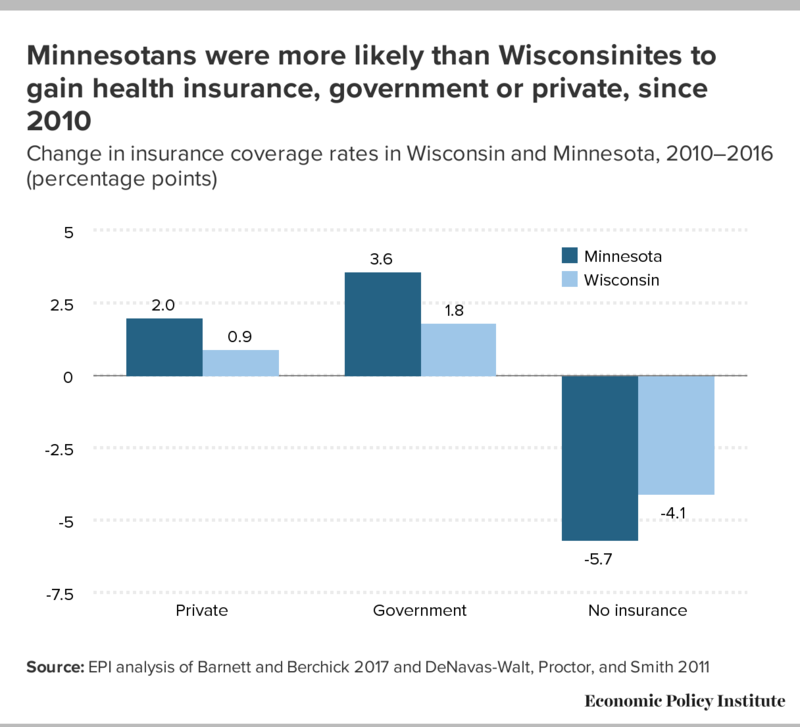 Yet at the same time, the share of the population with private health insurance also rose more in Minnesota (2.0 percentage points) than in Wisconsin (0.9 percentage points). In other words, denying low-income families in Wisconsin access to Medicaid did not appear to have led to any greater take-up of private health insurance. Finally, it’s been often said that people vote with their feet—that is, where people choose to live is an indicator of overall satisfaction with the quality of life, or the perceived potential for an improving quality of life, in a particular area. Table 3 shows data from the U.S. Census Bureau’s estimates of state resident population change. From April 2010 to July 2017, the population of Minnesota grew by 5.1 percent—slightly less than the U.S. average of 5.5 percent. Over the same period, Wisconsin’s population grew by only 1.9 percent. More tellingly, net migration—the sum of people moving in and moving out of a state—has been negative in Wisconsin from April 2010 to July 2017, with the state losing nearly 18,000 more residents than it has gained. This loss has been heavily driven by domestic migration: Nearly 70,000 more residents left Wisconsin to move to a different state than new residents moved in from elsewhere in the U.S. Precisely analyzing the causal impact of a particular policy requires sophisticated statistical methods—often using two geographies’ or two populations’ similarities as a means of isolating the effect of the policy from other factors that could influence outcomes. This report does not provide that level of causal analysis. Rather, it takes a higher-level look at some key metrics of economic performance and family well-being, and it assesses how these metrics have changed after seven years of very different policy agendas implemented in two very similar neighboring states. Although specific policies in either state may have had marginal impacts that bucked the larger trends, the sum of all these metrics leads to a very clear conclusion—outcomes for workers and families over the course of the last seven years have been markedly better in Minnesota than in Wisconsin. In some cases, it is possible to draw a straight line between a particular choice or set of policy choices and the effect it had on the state’s economy and the welfare of its residents. For example, Wisconsin’s Act 10 decimated the state’s public sector, leading to a loss of both public-sector jobs and the private-sector jobs that those public dollars supported. The combination of Act 10 and the adoption of a so-called right to work law led to a dramatic decline in the share of Wisconsin workers in unions. This almost certainly dampened wage growth, and it likely contributed to the state’s weaker income growth and slower progress reducing poverty. In addition, the Walker administration’s decision to reject federal health exchange funding, reject the Affordable Care Act’s Medicaid expansion, reject federal transportation dollars, and reject expanded federal unemployment insurance funding has likely contributed to slower job growth in the health care, transportation, and construction industries. It has likely led to higher numbers of uninsured residents, higher rates of long-term unemployment, and more people dropping out of the labor force. In contrast, Minnesota lawmakers’ large public investments in infrastructure, health care, and education fueled the state’s impressive job growth in construction, health care, education, and other industries. The state’s decision to raise its minimum wage spurred strong wage growth for low-wage workers. Expansions to state safety net programs and low-income tax credits likely helped to bolster incomes and bring down Minnesota’s poverty rate. And, importantly, there is little evidence that the tax increases enacted to finance the state’s investments, or the decision to raise the state minimum wage, did anything to hamper job growth. To be clear, conditions for workers and families in Minnesota today are not perfect. All of the metrics reviewed in this report could be better, and other metrics in Minnesota point to other problems. For example, there are striking racial inequities in Minnesota, with high poverty rates, high jobless rates, and severe racial segregation in the state’s urban centers (Nelson 2017; Gee 2016; Perry 2018). Advocates point to a lack of meaningful public and private investment in communities of color and misguided education policies that have encouraged racial segregation (Gee 2016). But the progress achieved in Minnesota over the past seven years is undeniable, and that progress has the fingerprints of good state policy all over it. The good news for Wisconsin is that achieving similar progress for Badger State workers and families is possible—but it will take a different policy agenda from the one the state has pursued for the past seven years. 6.9% 9.7% 2.3 ppt. 1.6% 5.4% 3.0 ppt. 6.0% 5.1% -0.7 ppt. -0.9% 0.8% 1.5 ppt. 1. All union membership data are from BLS 2018. As discussed in Bivens et al. 2017, unionization has been falling nationally for decades due to policy assaults at both the state and federal level. The fact that Minnesota’s unionization rate fell less than the national average over this period suggests that state policy action can push back against these national trends. 2. The “other services” category comprises establishments engaged in providing services not specifically provided for elsewhere in the North American Industry Classification System (NAICS). Establishments in this sector are primarily engaged in activities, such as equipment and machinery repairing, promoting or administering religious activities, grantmaking, advocacy, and providing drycleaning and laundry services, personal care services, death care services, pet care services, photofinishing services, temporary parking services, and dating services. 3. Author’s calculations using Current Employment Statistics data from the Bureau of Labor Statistics. 4. All labor force statistics come from EPI analysis of Current Population Survey basic monthly survey microdata from the Bureau of Labor Statistics. 5. The Census Bureau defines a household as the group of people who occupy a housing unit (such as a house or apartment) as their usual place of residence, including both families and unrelated persons. Families are groups of two or more people (one of whom is the householder) related by birth, marriage, or adoption and residing together; all such people (including related subfamily members) are considered as members of one family. Family income is typically higher than household income because it excludes single individuals living alone, who are counted as individual data points in measurements of household income. 6. EPI analysis of U.S. Census Bureau 2017c. 7. EPI analysis of U.S. Census Bureau 2018a and 2018b. 8. Author’s calculations using Short 2012 and Fox 2017. 10. Author’s calculations from BEA 2017 and 2018. 11. All population statistics are from U.S. Census Bureau 2017a and 2017b. Aleem, Zeeshan. 2015. “2 Years after Raising Taxes on the Rich, Here’s the Hellscape Minnesota Has Become.” Mic, March 2, 2015. Appelbaum, Eileen, and Ruth Milkman. 2011. Leaves That Pay: Employer and Worker Experiences with Paid Family Leave in California. Center for Economic and Policy Research. Associated Press. 2011. “AP Election Guide 2010.” NPR, February 18, 2011. Associated Press. 2012. “Walker Turning Down $37 Million Intended to Help Implement Health Care Reform Law.” Wisconsin State Journal, January 18, 2012. Associated Press. 2015. “Scott Walker Unveils Wisconsin budget.” CBS News, February 4, 2015. Barnett, Jessica, and Edward Berchick. 2017. Health Insurance Coverage in the United States: 2016. U.S. Census Bureau. Baum, Charles L. 2003. “The Effects of Maternity Leave Legislation on Mothers’ Labor Supply after Childbirth.” Southern Economic Journal 69, no. 4: 772–799. Bierschbach, Briana. 2014. “Minnesota’s New Minimum Wage, Explained.” MinnPost, August 1, 2014. Brinkman, Ellen. 2013. “Changes to Minnesota’s Sick or Injured Child Care Leave Law Effective August 1, 2013.” MinnesotaEmployer.com, July 29, 2013. Bureau of Economic Analysis (BEA). 2017. “Real GDP by State (Millions of Chained 2009 Dollars)” [online data table]. Last updated November 21, 2017. Bureau of Economic Analysis (BEA). 2018. “SA4 Personal Income and Employment by Major Component” [online data table]. Last updated March 22, 2018. Bureau of Labor Statistics (BLS). 2018. “Table 5. Union Affiliation of Employed Wage and Salary Workers by State” (economic news release). BLS website. Page last modified January 19, 2018. Bureau of Labor Statistics, Current Employment Statistics (BLS-CES). Various years. Public data series accessed through the CES National Databases and through series reports. Accessed April 2018. Bureau of Labor Statistics, Current Population Survey (BLS-CPS). Various years. Public data series aggregated from basic monthly CPS microdata and accessed through the Labor Force Statistics database and series reports. Accessed April 2018. Bureau of Labor Statistics. Local Area Unemployment Statistics (BLS-LAUS). Various years. Data from the LAUS are available through the LAUS database and through series reports. Accessed April 2018. Carroll, Douglas J. 2014. “Wisconsin Changes Unemployment Insurance Law to the Detriment of Employees.” HG.org Legal Resources. Caldwell, Patrick. 2015. “The Unnatural: How Mark Dayton Bested Scott Walker—and Became the Most Successful Governor in the Country.” Mother Jones, February 18, 2015. Center on Wisconsin Strategy (COWS). 2011. Wisconsin 2011: New Policies Put the Badger State on the Low Road. University of Wisconsin – Madison, July 26, 2011.
Cooper, David, and Lawrence Mishel. 2015. The Erosion of Collective Bargaining Has Widened the Gap between Productivity and Pay. Economic Policy Institute, January 2015. Davey, Monica. 2011. “Wisconsin Senate Limits Bargaining by Public Workers.” New York Times, March 9, 2011. Davey, Monica. 2015. “Unions Suffer Latest Defeat in Midwest with Signing of Wisconsin Measure.” New York Times, March 9, 2015. Davey, Monica, and Steven Greenhouse. 2011. “Wisconsin May Take an Ax to State Workers’ Benefits and Their Unions.” New York Times, February 11, 2011. DeNavas-Walt, Carmen, Bernadette Proctor, and Jessica Smith. 2011. Income, Poverty, and Health Insurance Coverage in the United States: 2010 (P60-239). U.S. Census Bureau, September 2011. Dornfeld, Steven. 2013. “Dayton Tax on Rich Would Send Minnesota Back Near Top of U.S. Rankings.” MinnPost, April 2, 2013. Fox, Liana. 2017. The Supplemental Poverty Measure: 2016 (P60-261). U.S. Census Bureau, September 2017. Gee, Taylor. 2016. “Something Is Rotten in the State of Minnesota.” Politico Magazine, July 16, 2016. Gould, Elise, and Will Kimball. 2015. “Right-to-Work” States Still Have Lower Wages. Economic Policy Institute, April 2015. Helgeson, Baird, Jennifer Brooks, and Rachel E. Stassen-Berger. 2013. “$2 Billion Tax Plan Wins Final Approval on Deadline at Capitol.” Minnesota Star Tribune, May 21, 2013. Hovorka, Alan. 2017. “Walker: Tax Cuts Will Exceed $8 Billion if Budget Proposal Passes.” Politifact Wisconsin, July 12, 2017. Irons, John. 2009. Economic Scarring: The Long-Term Impacts of the Recession. Economic Policy Institute Briefing Paper no. 243, September 2009. Jacobs, Lawrence R. 2013. “Right vs. Left in the Midwest.” New York Times, November 23, 2013. Johnson, Shawn. 2015. “Wisconsin Governor to Sign Right-to-Work Bill amid Protests.” NPR, February 25, 2015. League of Minnesota Cities. 2011. 2011 Law Summaries: Final Legislative Action, Minnesota Sessions Laws 2011. Luhby, Tami. 2011. “Minnesota Shutdown: It’s Over.” CNN Money, July 20, 2011. Markusen, Ann. 2015. “The High Road Wins: How and Why Minnesota Is Outpacing Wisconsin.” American Prospect, Spring 2015. Melo, Frederick. 2017. “Minneapolis and St. Paul Paid Sick Leave Ordinances: What You Need to Know.” Twin Cities Pioneer Press, February 19, 2017. Nelson, Cody. 2017. “Report: Minnesota 2nd Worst State for Racial Inequality.” Minnesota Public Radio, August 23, 2017. New Richmond News. 2011. “Gov. Scott Walker: ‘Wisconsin Is Open for Business’; Complete Transcript of Speech.” January 3, 2011. Office of the Governor, Mark Dayton. 2011. “Governor Dayton Signs Executive Orders Implementing Medicaid Opt-In in First Act as Governor” (news release). January 5, 2011. Perry, Susan. 2018. “Minnesota’s Racial and Ethnic Disparities Are Underscored in Latest County-by-County Health Rankings.” MinnPost, March 14, 2018. Pollack, Ethan. 2009. Dire States: State and Local Budget Relief Needed to Prevent Job Losses and Ensure a Robust Recovery. Economic Policy Institute Briefing Paper no. 252, November 2009. Rothstein, Jesse. 2011. “Unemployment Insurance and Job Search in the Great Recession.” Brookings Papers on Economic Activity, Fall 2011: 143–213. Shierholz, Heidi, and Lawrence Mishel. 2011. Sustained, High Joblessness Causes Lasting Damage to Wages, Benefits, Income, and Wealth. Economic Policy Institute Briefing Paper no. 324, August 2011. Short, Kathleen. 2012. The Research Supplemental Poverty Measure: 2011 (P60-244). U.S. Census Bureau, November 2012. Stein, Jason. 2012. “State to Return $11 Million Federal Grant in Dispute over Health Care Law.” Milwaukee Journal Sentinel, January 20, 2012. Stein, Jason. 2013. “Much of Tax Savings from Scott Walker’s Proposed Cut Would Go to Top 20%.” Milwaukee Journal Sentinel, February 24, 2013. Stein, Jason, and Guy Boulton. 2013. “State Notifying 92,000 That Loss of BadgerCare Imminent.” Milwaukee Journal Sentinel, September 24, 2013. Stein, Jason, and Patrick Marley. 2012. “In Film, Walker Talks of ‘Divide and Conquer’ Union Strategy.” Milwaukee Journal Sentinel, May 10, 2012. Stein, Jason, Patrick Marley, and Lee Bergquist. 2011. “Walker’s Budget Cuts Would Touch Most Wisconsinites.” Milwaukee Journal Sentinel, March 1, 2011. Umhoefer, Dave 2012. “Gov. Scott Walker Says He Eliminated Wisconsin’s $3.6 Billion Deficit without Raising Taxes.” Politifact Wisconsin, January 29, 2012. U.S. Census Bureau. 2017a. “Table 2. Cumulative Estimates of Resident Population Change for the United States, Regions, States, and Puerto Rico and Region and State Rankings: April 1, 2010 to July 1, 2017 (NST-EST2017-02)” [Excel file]. Release date December 2017. U.S. Census Bureau. 2017b. “Table 5. Estimates of the Components of Resident Population Change for the United States, Regions, States, and Puerto Rico: July 1, 2016 to July 1, 2017 (NST-EST2017-05)” [Excel file]. Release date December 2017. U.S. Census Bureau. 2017c. “Table 21. Number of Poor and Poverty Rate, by State: 1980 to 2016” [Excel file]. Release date September 8, 2017. U.S. Census Bureau. 2018a. “American Community Survey Table R1701: Percent of People below Poverty Level in the Past 12 Months.” Generated using American FactFinder. Data for various years. Accessed April 2018. U.S. Census Bureau. 2018b. “American Community Survey Table R1704: Percent of Children under 18 Years below Poverty Level in the Past 12 Months.” Generated using American Factfinder. Data for various years. Accessed April 2018. U.S. Census Bureau. 2018c. “American Community Survey Table B19013: Median Household Income in the Past 12 Months.” Generated using American FactFinder. Data for various years. Accessed April 2018. U.S. Census Bureau. 2018d. “POV46: Poverty Status by State—People under 18 Years of Age” [Excel file]. Data for various years. Accessed April 2018. U.S. Census Bureau, Current Population Survey Annual Social and Economic Supplement microdata (U.S. Census Bureau CPS ASEC). Various years. Survey conducted by the Bureau of the Census for the Bureau of Labor Statistics [machine-readable microdata file]. Accessed April 2018 at https://thedataweb.rm.census.gov/ftp/cps_ftp.html. U.S. Census Bureau, Current Population Survey basic monthly microdata (U.S. Census Bureau CPS basic). Various years. Survey conducted by the Bureau of the Census for the Bureau of Labor Statistics [machine-readable microdata file]. Accessed April 2018 at https://thedataweb.rm.census.gov/ftp/cps_ftp.html. U.S. Census Bureau, Current Population Survey Outgoing Rotation Group microdata (U.S. Census Bureau CPS-ORG). Various years. Survey conducted by the Bureau of the Census for the Bureau of Labor Statistics [machine-readable microdata file]. Accessed April 2018 at https://thedataweb.rm.census.gov/ftp/cps_ftp.html. Wisconsin Budget Project. 2011. Tax Cuts and Tax Increases in the Budget Bill and 2011 Special Session Bills (fact sheet). July 14, 2011.